"If you are going to win any battle, you have to do one thing. You have to make the mind run the body. Never let the body tell the mind what to do... the body is never tired if the mind is not tired." 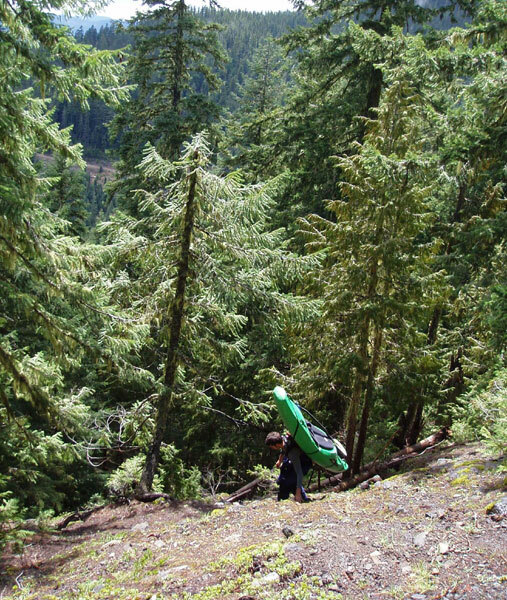 We had been studying the headwaters of the Fish Creek drainage on the Clackamas river for a few years, and by all indications it looked good. It seemed large enough, there was significant gradient, and the lower sections were wide enough and had a character that suggested there might be good rapids upstream. There used to be a road that accessed the upper reaches of this creek, but the road was so badly damaged during the floods of '97 that the Forest Service decided not to repair it. In fact, they went one step further and actually tore all of the asphalt off of the road, turning the entire Fish Creek drainage into a roadless 'wild' area. The remains of the road paralleling the creek eventually turned into a path of sorts that runs along the length of the creek. After looking at the approach options, we decided not to use the trail because this would require an 8.5 mile hike on a steady uphill grade, much of this past class II-III stuff that isn't worth the effort. 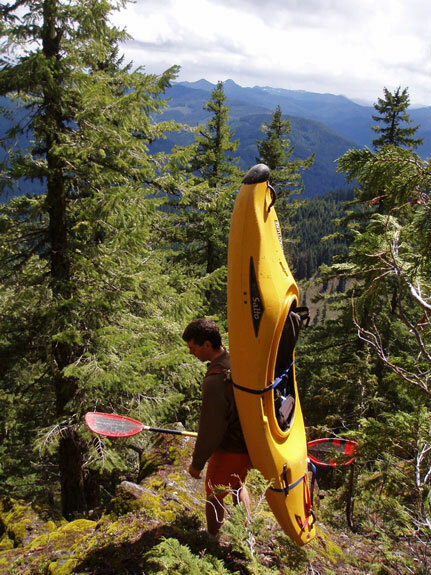 With this in mind, Pete scouted out an alternative approach to Upper Fish Creek. Pete's three-phase plan seemed fairly challenging but we estimated that we could probably complete the approach in about two hours, as shown below. The plan was to approach the headwaters of Fish Creek from the Southeast side. The distance as the crow flies was just over two miles, but the terrain was very rugged. 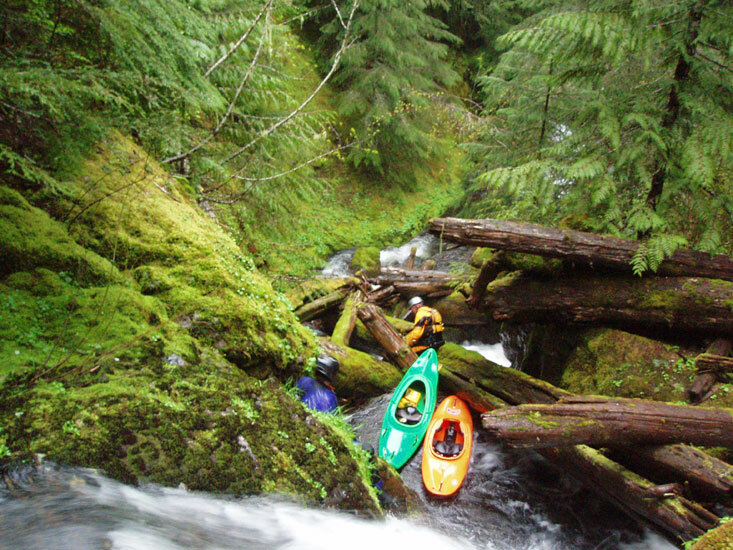 Our route would put us in Fish Creek about four and a half miles above the confluence of Wash Creek, which was just over six miles above the confluence with the Clackamas River. However, we had left a car where the asphalt ended two miles up Fish Creek road, so that meant we would have about eight miles of paddling on Fish Creek once we reached the end of our hike. Phase I ( The initial ascent ) involved an extremely steep 570-foot ascent of a ridge between two rocky, 5000-foot peaks. 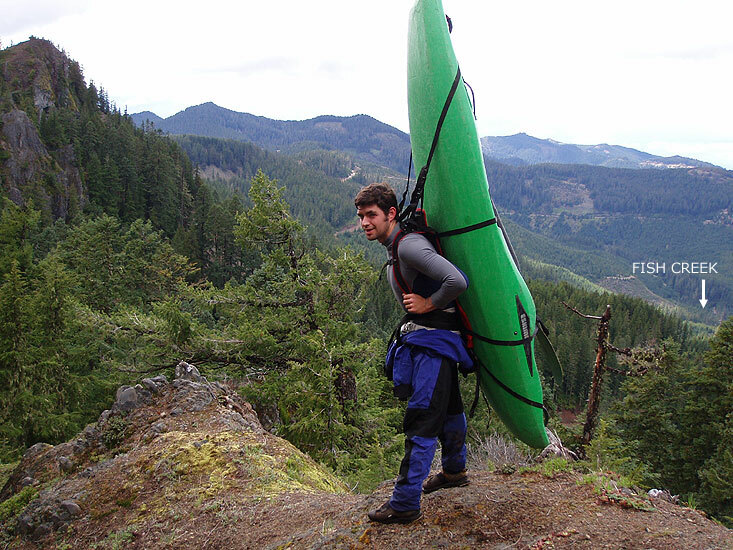 Once we topped out, we would lower our boats and gear 300 feet off the back side of the ridge to an old road. 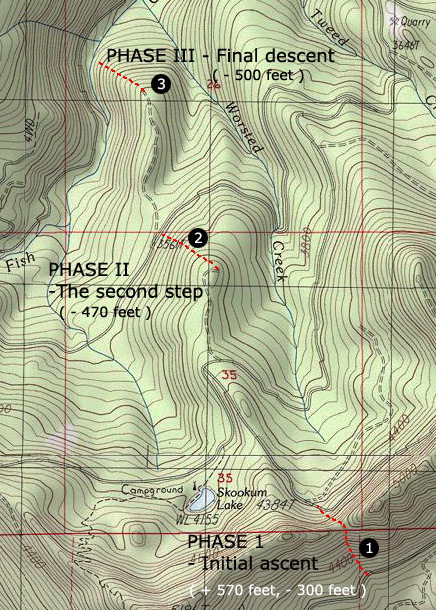 Once on the road, we would follow it about a half mile to reach phase II, 'The second step'. Phase II ( The second step ) Walk a half mile down a road which has been 'removed' by the Forest Service, then descend 470 feet down through a clear cut. Phase III ( The final descent ) Walk a quarter mile down another 'removed' road, then descend 500 feet down to the creek..
Jesse Coombs and Mike Long met Pete and I at Bob's Hole on the Upper Clackamas, which is just downstream from the Fish Creek confluence. The day had been alternately sunny and rainy as the thunderstorms moved through the valley, so we took advantage of a sunny window to consolidate the gear for the shuttle. 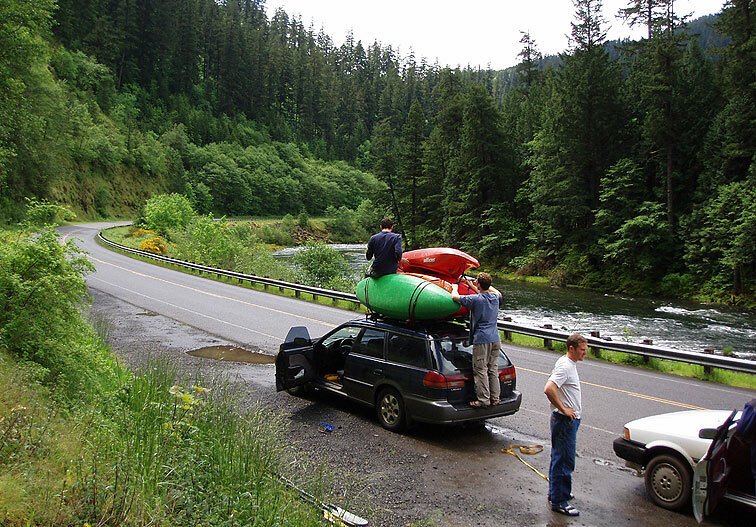 Loading the boats at Bob's Hole on the Upper Clackamas. We dropped Pete's car at the end of Fish Creek road and drove north towards Bagby Hot Springs. Soon the road curved around and the timber got older as we approached the start point for our hike. Once we arrived at the base of the ridge, we quickly unloaded and started the grueling climb up the side of the ridge with our boats and gear on our backs. The ridge was very steep, and we had to move carefully because a single slip would send us tumbling back down through the trees, a serious risk considering our kayaks strapped on our backs with backpack units. It took a solid hour to climb this first pitch, which involved 570 feet of vertical gain. We were all breathing hard by the time we reached the top. Mike Long approaches the top of the extremely steep, 570-foot climb during 'Phase I' of our approach. The road where we were dropped off is visible in the background. Pete Giordano takes a breather after topping out during 'Phase I'. Once we were in the saddle between the two rocky peaks, we cast around for a likely spot to lower our boats. At this point the wind started blowing hard and we could see the thunderheads marching towards us, blotting out the sun as they came. This was both good and bad; we were counting on the water to boost the flows, but rain would also make all movement slower and more treacherous..
Mike Long enjoys the views of the Fish Creek drainage. From here, we lowered our boats 300 feet off the back side of the saddle and began 'Phase II' of our approach. All of the roads visible in the background are no longer accessible because the Forest Service has closed the entire drainage to motorized traffic. We chained the boats together and started lowering them down the first of several pitches off of the backside of the ridgeline. 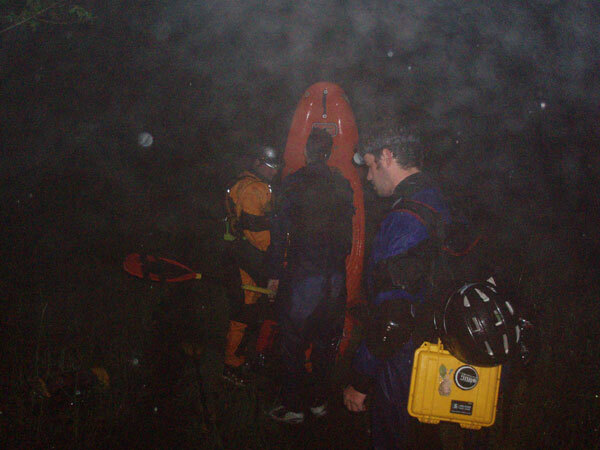 Pete's boat tipped over, spilling out some of his gear and his helmet, but luckily none of it fell that far. At the bottom of the ridge was an old, torn-up road ( see map ) where we encountered snow for the first time. We quickly re-packed our ropes and headed off down the road. Soon the road petered out at a log landing. Almost on cue I felt a few big, fat raindrops hit my head, and then the sky opened up. Pete cast about for the best way down ( it seemed very, very steep! ) but finally we determined there was no 'best way' and we all just walked into the wall of Rhododendrons and started thrashing our way down. This 'second phase' of our approach was very tough. The rain was pouring, the underbrush was incredibly thick, and the hillside was extremely steep. The combination of these factors meant that we ended up doing an exhausting combination of walking, sliding, and falling our way down the hill..
Jesse Coombs begins the long, steep descent down the 'second step', as a thunderstorm pours rain down. 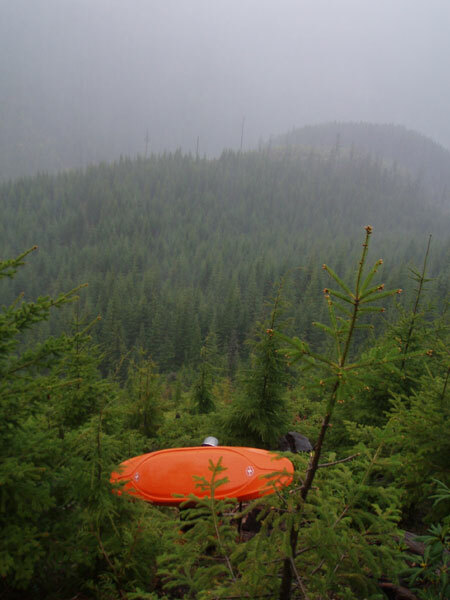 This phase involved 470 feet of elevation loss through a clear-cut crammed with Rhododendron plants. The Fish Creek drainage is just over the next horizon line..
At the base of the clear-cut near the treeline the underbrush was so thick it was nearly impenetrable. "THIS REMINDS ME OF WHEN I WAS BACK IN THE 'NAM!!" I yelled to no one in particular as I tunneled and groveled my way through the wall of greenery. Somebody laughed, somebody else cursed, and I heard a crashing sound as somebody else slipped and fell for the 1,000th time. It was exhausting, but finally we burst from the wall of greenery onto second old road, which would lead us to the third and final phase of our approach. Pete Giordano and Jesse Coombs take a much-needed break at the end of 'Phase II'. The upper Fish Creek drainage is visible in the background. It was now 5:20, and we had nine miles of hiking and paddling in front of us.. Gotta keep movin'.. The final pitch down to the creek was the worst of all. We arrived to find a 500-foot steeply sloping canyon wall which was dirt and mud for the first hundred feet or so, then a 25-foot vertical cliff band. Below the cliff band was 200-300 of elevation loss over an extremely steep and loose scree slope to the creek, which we couldn't actually see because it appeared to be in a vertical-walled gorge. Jesse, who was carrying a very light playboat, immediately down-climbed to the top of the cliff band and roped his little boat down the cliff face. The rest of us, burdened by much heavier boats and gear, plodded to the top of the muddy slope and set a belay on a sketchy-looking stump above the cliff-band. 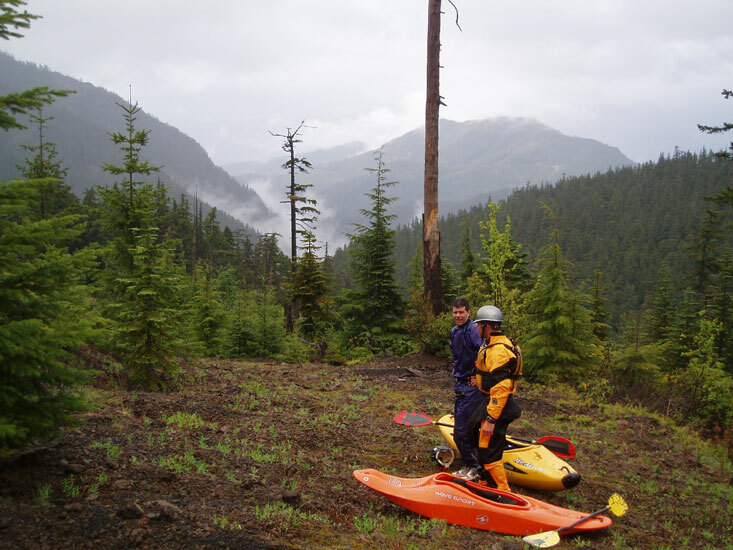 As the rain fell harder, Mike and I got ready to lower the boats as Pete and Jesse traversed along the cliff band until they found a narrow gully that allowed them to down-climb and get the boats. After some delay, we lowered the boats and then Mike and I down-climbed and started the final descent to the creek. The final 200-300 foot descent below the cliff band was possibly the sketchiest of all, because the entire slope consisted of loose, sharp scree that shifted and slid around unnervingly under our feet as we slid and struggled down to the creek. Once we arrived the gorge wall that contained the creek we had to scout for a weakness in the wall so we could down-climb to creek level. One last rope-lower, one last steep down-climb, and we were in the creek. It was now 6 p.m. and we estimated that we had a little over two hours of daylight left, so we quickly went through the process of packing our climbing gear and getting ready to paddle. I say 'quickly' but in reality we were anything but quick. The brutal approach had drained our energy levels to the point that we were moving in slow motion, but it was about to get even worse..
Mike and Jesse were ready first and headed downstream. Pete and I followed shortly after, and when we rounded the corner the creek pooled ominously above a large pile of logs. I could see Mike standing on top of the logs looking down, and then he dropped out of sight. There was probably a rapid somewhere under there, but the gigantic mass of logs so obscured the drop that it was pretty much impossible to determine what it was once like. .
Mike and Jesse work their way through a difficult and complicated logjam portage on Upper Fish Creek. 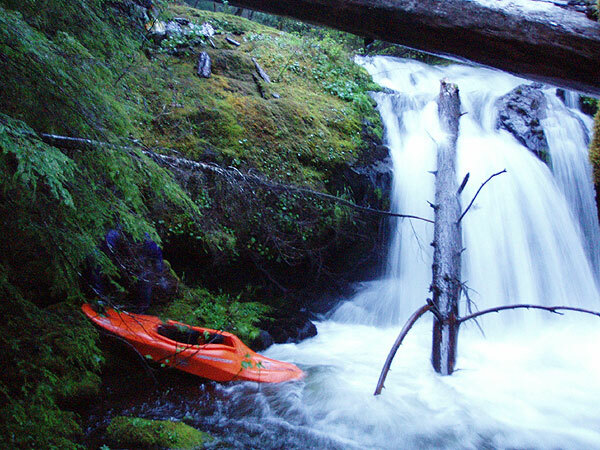 As we worked our way through the first portage the tension started to mount as we realized that the creek might not be boatable at all. We completed the first portage and rounded the corner to find.. another log portage. And another. We were burning daylight and our precious remaining energy reserves and it seemed impossible to move efficiently at creek level. Finally we made the call to climb up to the old road and continue down until the creek was runnable. The climb up to the road required a tremendous force of will. We were all very tired at this point, and hauling our boats and gear up the steep gorge wall to the road seemed to be a nearly impossible task. After a ten or fifteen minute struggle up the wall of the gorge we arrived at the road, and after a necessarily short rest we shouldered our boats and started walking down the trail. After a half mile or so, we climbed back down to the creek and attempted to paddle some more. We encountered more wood, wood-filled ledges, wood-filled boulder gardens, wood-wood-WOOD. There were some runnable rapids, but the effort required to reach them was unbearably high. More portaging.. this falls had a steep rapid leading into it around a blind corner. Most of the water goes to the creek-left side of the falls (not pictured here) into a deadly, log-choked mess. This was fairly typical of the drops on Upper Fish Creek: More wood than rocks for the most part. Finally Mike got pinned on a log when he probed a drop and we decided to climb up to the road and hike out, this time for good. There was too much wood, we were too tired, and we knew it was only a matter of time before something really bad happened. Darkness fell as we shouldered our boats and headed down the road. It was still raining, it seemed like it would never stop. Our legs felt like lead but we continued on. After a mile or so Pete, Mike and I were forced to abandon our boats; we still had four miles to go and we had pretty much hit the wall.. it was leave the boats or spend the night, which we were not willing to do. Just after midnight.. the rain was coming down hard.. only a few miles to go now.. very tired. The final four miles back to the car was a blur of exhaustion and pain. Every joint in my body seemed like it was filled with sand, and each step sent fiery needles shooting up my legs. We were all hurting but we continued to stumble along like zombies, totally spent but unwilling to quit. Jesse was still carrying his light playboat and we traded off carrying it so he could rest. It was amazing how heavy that little boat felt as we approached the end of our long torturefest. We finally reached Pete's car at 1 a.m., which meant we had been hiking, portaging, and climbing with our boats for over ten hours straight. When we got back to Pete's house and got out of his car I laughed as I watched him walk to his front door because he was teetering along like he was a hundred years old. I imagine I probably looked much the same. I shouldn't have driven home, but I did. I fell asleep at the wheel a couple of times and ended up getting lost somewhere near Stafford because I woke up and couldn't remember what turns I had taken. I was utterly spent.. I finally made it home at 2:30 and was asleep by 3 a.m. on what was now Thursday morning. When the alarm went off for work at 6:45, my body felt like it had been run over by a truck and then encased in cement.. This was definitely the most brutal, exhausting kayaking debacle I have ever experienced! Prologue - Going back for the boats.. The following day (Thursday) Pete summoned up the strength to hike back in and retrieve his boat. I honestly don't know how he managed it, but he's a pretty tough guy. He did all of this after working a full day on the river, and ended up running out of light (again) a couple of miles down, which meant he had to carry his boat out the final couple of miles back to his car. On Friday I walked back in and paddled down. The wood situation was awful all the way to the Wash Creek confluence, lots of portaging, then it improved somewhat and actually got pretty good for awhile but it was depressing because Fish creek is one of the runs the Forest Service chose to cable logs into, which makes the rapids very dangerous. There are cables and logs all over the place on the lower part of this creek, most of which have been torn loose and cast about, just waiting to trap the unwary paddler. I can't understand how anyone who even has the most basic understanding of hydrology could ever think that a cabled log would stay where it was placed, but I suppose that is what we get from huge government bureaucracies who are disconnected from reality: Failed policies that have deep and long-lasting negative consequences for everyone involved. In short, the Forest Service did not do anything for fish habitat in the long term, and at the same time they have prevented anyone from having a safe paddling experience on Fish Creek. This is really too bad, because there are some really good quality class III-IV rapids on the lower section, and the scenery is top-notch.